1 of 1 Whisk together vinaigrette, peanut butter, 2 tablespoons water, garlic, lime juice, and chili-garlic sauce; set aside. 1 of 1 Divide lettuce among four plates. 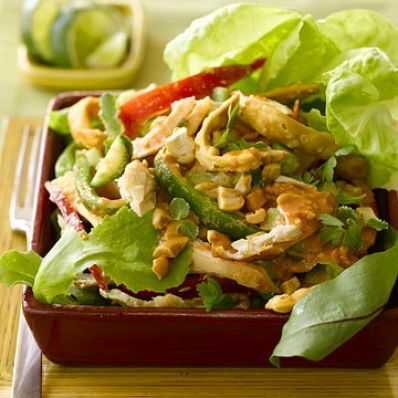 In a medium bowl, toss together chicken, cucumber, bell pepper, cilantro and mint. Add Peanut Butter Dressing; gently toss to coat all ingredients. Spoon chicken mixture over lettuce on plates. Sprinkle with rice noodles and cashews. Serve with lime wedges, if desired.